Jag njuter *så* av att solen lyser och det finns (hopp om) vår i luften. Jag deltar i följande utmaningar: Digi Sketch (Sketch + ATG), Catch the Bug (Spring into Spring), Simon Says Wednesday (Things that fly), Suzy Bee (Spots or Stripes), Craft your Passion (ATG), Avenue 613 (ATG) och Sister Act (ATG+Bloghop). Very beautiful! I like these bright colours and this cute image! So sunny card - it gives you this spring feeling. Thank you very much for sharing it with us at 613 Avenue Create this week! Good luck! Gorgeous card Jessi! So sweet and pretty. Lovely card. Thank you for joining us at Catch the Bug this week! Your card is beautifully bright and cheery! Just beautiful! I love the colors - flowers & butterflies! 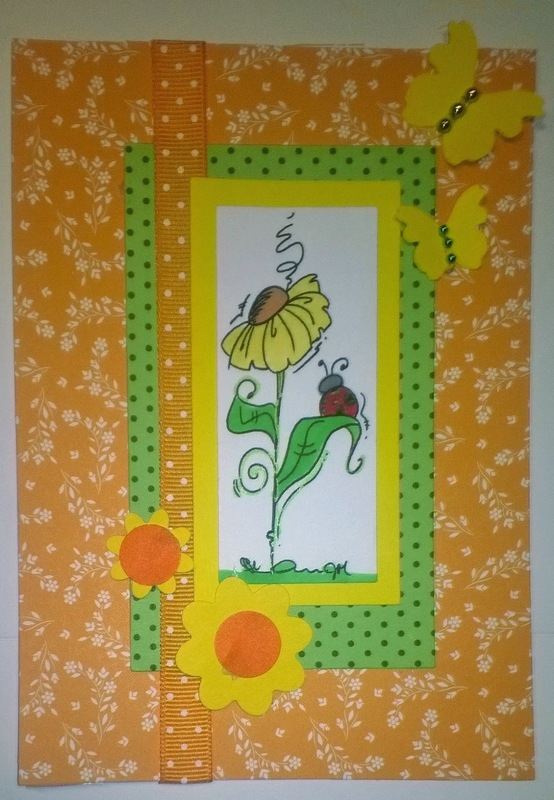 Thank you for playing along with us this week for the The Spring into Spring Bug Challenge with Bugaboo Stamps! Don’t forget to check out The Bug Blog for our new releases and Friday Freebie this week!